Sunset time-lapse of Saint Mark Square at night from San Giorgio. Home Italy Sunset time-lapse of Saint Mark Square at night from San Giorgio. Categories: Venice Stock Footage Reel, Italy Stock Footage Reel, Italy. Tags: ancient, architecture, attraction, boat, building, campanile, canal, city, cityscape, europa, europe, european, europeo, gondola, grand canal, illuminated, italia, italian, italiano, italy, landmark, lapse, lights, marco, mark, night, piazza, reflection, saint, saint mark, san, san giorgio island, square, sunset, time, time lapse, tourism, tower, travel, venetian, veneto, venice, view, water. Saint Mark Square time-lapse at night from San Giorgio. Boats seen in the canal. Shot in Venice, Italy. 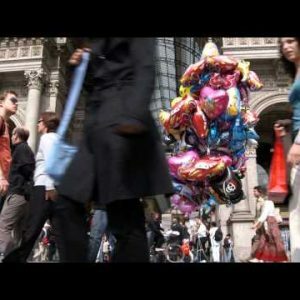 Royalty Free Stock Footage of Crowd in Milan Italy. Royalty Free Stock Footage of Entrance of a Milan mall. Royalty Free Stock Footage of People passing by a plaza at sunset in Bologna Italy.